Ashoka is looking for leading social entrepreneurs who not only deliver direct services and provide immediate alleviation of needs but also work to change mindsets and systems in order to address root causes of a problem with a long-term perspective. Work in populations needing services, food, and/or a direct benefit to their wellbeing. 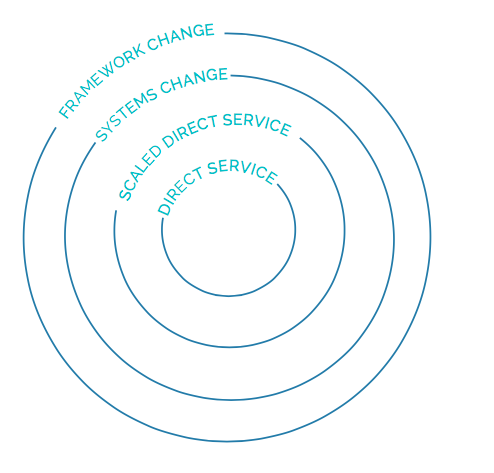 Direct service has a clear and concrete feedback loop - you see hungry people being fed; students gaining skills through mentorship; or the clients getting legal help. Examples: Soup kitchens, small-scale mentoring programmes for students, legal services for community members. Models that unlock efficiency and impact through well- managed logistics of an intervention or solution. Scaled direct service benefits large numbers of individuals. Examples: The Red Cross, Doctors Without Borders, or large scale refugee resettlement programmes. A new model that addresses the root cause of a problem. It often involves policy change, widespread adoption of the methodology by leading organisations in a sector, and new behaviours within existing markets or ecosystems. Examples: Micro-credit is a fundamentally new innovation for women to lift themselves out of poverty. Wikipedia democratises the way information is shared online. Change affecting individual mindsets at a large scale, which will ultimately change behaviours across society as a whole. 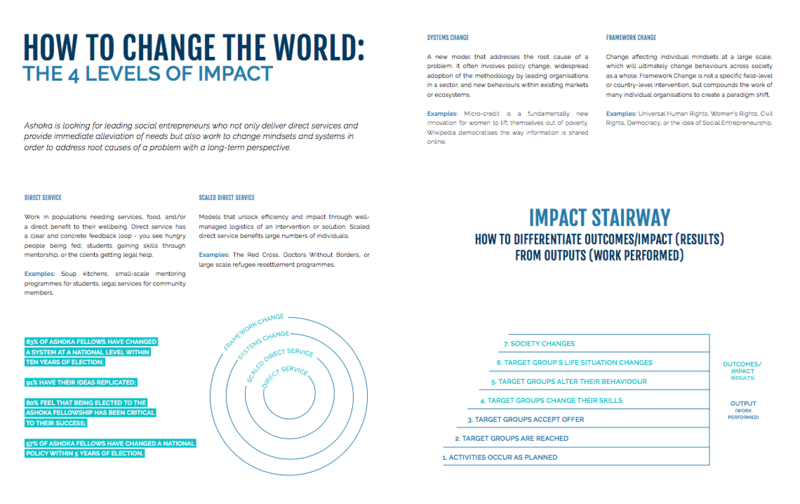 Framework Change is not a specific field-level or country-level intervention, but compounds the work of many individual organisations to create a paradigm shift.